Tucked away under a canopy of trees this charming home sits in its woodland surroundings whilst still being only a short walk from local shops, sought after schools and excellent transport links. A hard surface driveway with parking at the end for several cars winds down towards the house, it`s gardens and woodlands behind providing a beautiful backdrop. Although there is a front entrance door, an informal one to the side opens into a welcoming hallway with space for coats and shoes and access into a useful wet room. First on your right is the second reception room which would make a perfect dining room, home office or even a playroom. Next door is the elegant spacious sitting room. It is a cosy retreat with exposed beams and a large inglenook fireplace with wood burning stove offering warmth in the colder months. Returning to the hallway and down some steps to the rear is the pretty country kitchen. Dual aspect windows bring in leafy views while wooden effect counter tops and tiled flooring contrast beautifully with the exposed brick wall and beams overhead. A glazed door to the rear leads out to the terrace and garden beyond. The kitchen delivers wonderful cooking facilities with an oil fired Stanley range cooker, slimline dishwasher, washing machine and fridge/freezer. Climbing the stairs to the first floor there are two double bedrooms flooded with light from windows offering beautiful tree top views and both featuring exposed beams. The master bedroom has an en-suite bathroom with beautiful roll top bath. The bathroom completes the floor with a roll top bath, period detailed sanitary ware and windows bringing in natural light. A further flight of stairs off the wide landing leads to the 2nd floor and a large space which can be used as 3rd bedroom. Outside the fantastic garden has a paved terrace, sloping lawns and access into rambling woodland behind. A rich variety of plants and flowers are dotted amongst the front and rear grounds which meander down towards a stream and lake behind the property. This is a beautiful home with immense character. A must see! Wet Room: rear aspect window, tiled wet room flooring, wall attached hand held shower, rainwater shower head, part tiled walls, low level WC, slimline wall hung wash hand basin with mixer tap and exposed wall and ceiling beams. Reception 2/Dining Room: front and side aspect windows, slate flooring, radiator and exposed wall and ceiling beams. Living Room: front aspect windows, front aspect entrance door, split level living area divided by exposed beam columns, exposed ceiling beams, Inglenook fireplace with wood burning stove and radiators. Kitchen: side and rear aspect windows, rear aspect glazed door opening onto garden terrace, tiled flooring, exposed ceiling beams, feature exposed brick wall, stainless steel sink with mixer tap and drainer, Oil Fired Stanley Range Cooker, under counter slimline dishwasher, under counter washing machine, freestanding fridge/freezer, wooden effect counter tops and base level cupboards. En-suite: rear aspect window, clawfoot roll top bath with hand-held shower attachment, wooden flooring, low level WC and wall hung wash hand basin. Bedroom 2: front aspect window, exposed ceiling and wall beams and radiator. Bathroom: side aspect windows, roll top bath, pedestal wash hand basin with mixer tap, low level WC, exposed wall beams, sloping ceiling, wooden effect flooring and radiator. Study/Bedroom 3 Potential: front and rear aspect windows, exposed beams, wooden flooring and radiator. Outside: To the front of the property is a hard surface driveway with parking for several cars and areas of lawn and mature hedging, plants and trees. At the rear is a paved terrace, area of lawn, mature plants, trees, flowers and natural woodland boarders. Southborough lies just a couple of miles north outside the historic spa town of Tunbridge Wells with its big retail names and its Georgian colonnade, the Pantiles, offering a vibrant café culture. 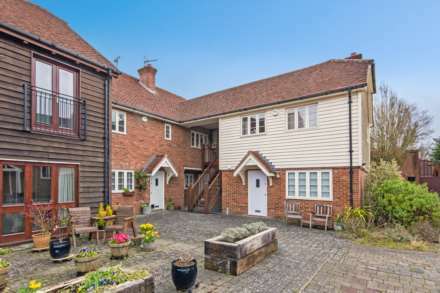 It also sits just south of Tonbridge, with the A26 passing through it offering easy access to the A21 which leads to the M25. Southborough Common, situated near to 1 Wood Cottage, is a conservation area where cricket has been played for more than 200 years. If you`re a runner, dog owner or casual walker, the woodland area of the Southborough Common, nestled behind St. Peters Church, is a very beautiful space. Ancient and young trees slope down to a stream with access to Holden Pond and Bidborough and Speldhurst villages beyond. Excellent secondary, independent, preparatory and private schools can be found in both Tunbridge Wells and Tonbridge, while Southborough and Bidborough have their very own primary schools. 1 Wood Cottage is also within the catchment areas for the 5 highly regarded and sought after Tunbridge Wells and Tonbridge Grammar Schools. 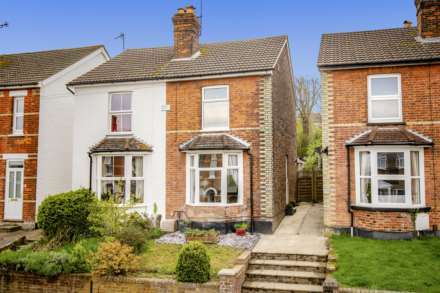 The nearest mainline station to Southborough is at High Brooms, about a mile away via a cut through walk way, with fast and frequent train services to London Charing Cross. There are also mainline stations on the same line at Tonbridge and Tunbridge Wells. Tonbridge Station is just over 2 miles away and with two lines passing through, it provides on average 34 trains a day from Tonbridge to London Bridge in as little as 32 minutes journeys. If that isn`t enough, nearby is a luxury coach service straight to Canary Wharf, the City, Embankment and other central London destinations at half the cost of rail travel enabling you to slumber or work using its Wi-Fi connectivity as you travel.